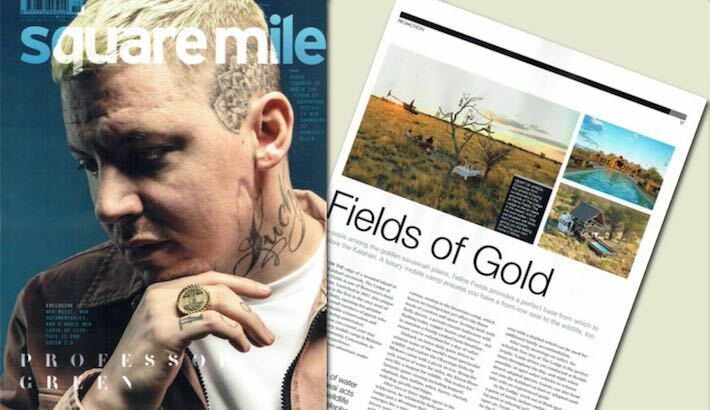 Feline Fields’ Lodge and our new luxury mobile camp in Khwai were featured in Square Mile magazine, a London men’s lifestyle magazine. Set on the edge of a wooded island in the Kalahari savannah, The Lodge at Feline Fields is one of Botswana’s most serene retreats. Launched in 2017, this unique six-suite lodge is the first in the area west of the Okavango Delta, opening this pristine environment to small numbers of guests who appreciate the valuable conservation and community work being undertaken. New for 2018, you can extend your stay here at the new luxury mobile camp in Mababe Marshes, Khwai Community Concession, to enjoy a unique safari experience.